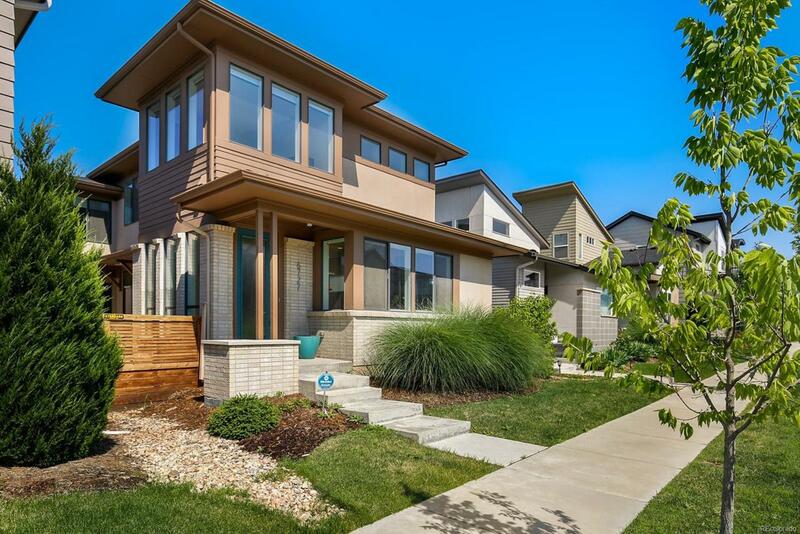 Impeccably maintained home full of custom builder finishes at sleek Midtown community! Luminous great room with soaring ceilings, modern fireplace with dual walk-out access to entertainers patio. Contemporary European inspired kitchen boasting lux GE Caf gas stove/oven with grill, custom cabinetry and beautiful countertop to ceiling windows that drench the entire space in light. Relaxing owners retreat with a bright lounge, spa-inspired bath with dual entry couples shower and his/her closets with custom built-ins. Double tier upper-level with convenient laundry room and 2nd bedroom suite. Builder finished basement with stylish stained concrete flooring, family/rec room with wet bar hook-ups, guest bedroom and bath. Additional features include hand-spackled wall finish, 2 storage closets, central vacuum system, frosted windows for added privacy and USB charging stations. Over $100,000 in upgrades in an award-winning design. This 'stunner' is the must see on your list!